With the lifetime exemption amount for gift and estate taxes at nearly $5.5 million, most taxpayers are not concerned about their heirs having to pay estate taxes. 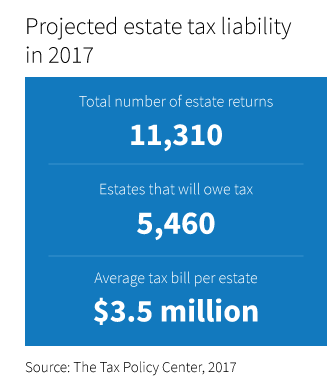 Still, the Tax Policy Center found that in 2017 there were more than 5,000 estates that owed estate tax with an average bill of $3.5 million for each estate. Some of these families may not be aware of a valuable deduction that may be available to them — the deduction for income in respect of a decedent, or IRD. IRD is income that was owed to the deceased person at the time of their death, such as retirement account assets. A beneficiary of a retirement account generally owes taxes on distributions from those accounts. If the estate paid federal estate taxes, the beneficiary is eligible for a deduction based on the amount of the estate tax paid. This deduction may be overlooked, especially if the tax professional who prepares the beneficiary’s personal income tax return is not the same person who prepared the decedent’s federal estate tax return. This example illustrates how it works. Assume an estate owed and paid $1 million in federal estate taxes, and one half of the taxable estate was composed of retirement assets. The estate tax attributable to retirement assets would be $500,000. In this case, a beneficiary taking distributions from the inherited retirement account is eligible to deduct $500,000 worth of those distributions against federal income tax. Taxpayers inheriting retirement assets or annuities should consult with their tax professional to see if the IRD deduction applies to their situation. Additionally, it is important to note that federal income tax returns can be amended back three years.